There’s going to be a cr@pload of information about Windows Phone 8 hitting the web, so I’m just providing the highlights of the Summit announcements in quick, chronological order. Bear in mind that these announcements were pitched at developers – new features and functionality for end-users to be announced sometime in the near future! Easy to forget, but today is the FIRST official announcement that the next Windows Phone will be called Windows Phone 8. No big surprise, but it’s been known as “Apollo” before today. According to Amazon US, 7 out of the 9 top-rated smartphones run Windows Phone! Windows CE (Windows Embedded) – the foundation of Windows Phone, is going to be replaced by Windows Core (basically the Windows NT kernel), the same platform that will power Windows 8. Confirmation of Native Code support – write your apps once, and (with tiny tweaks) run it anywhere in the Windows ecosystem. This extends to DirectX and driver support – write once, run anywhere. Support for dual-core processors at launch, with multi-core support built-in (ridiculously, the platform supports up to 64 cores – as if we’ll ever see that in a smartphone)! New maximum screen resolution of 1280×768 (WXGA). Support for removable Micro SD cards. I think this is less important than people think, thanks to integrated SkyDrive access. NFC support is built-in, and mandatory. 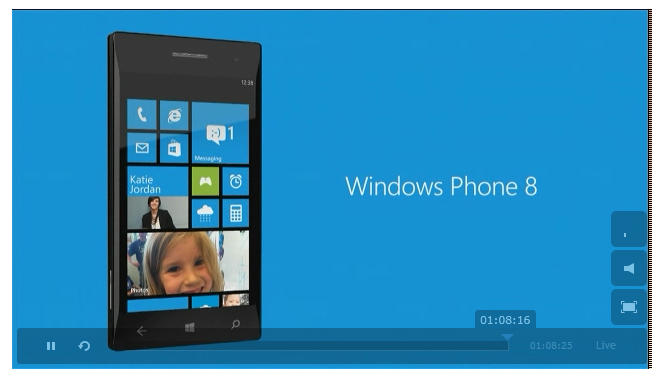 IE10 will be integrated into Windows Phone 8. IE10 will support twice the number of HTML5 features that IE9 on Windows Phone 7.5 does. New Wallet Hub revealed. Stores credit/debit card details, membership cards (car/airline/store/etc. ), vouchers and coupons. Allows third-party app integration into the new hub. Also supports NFC “Tap to Pay”. 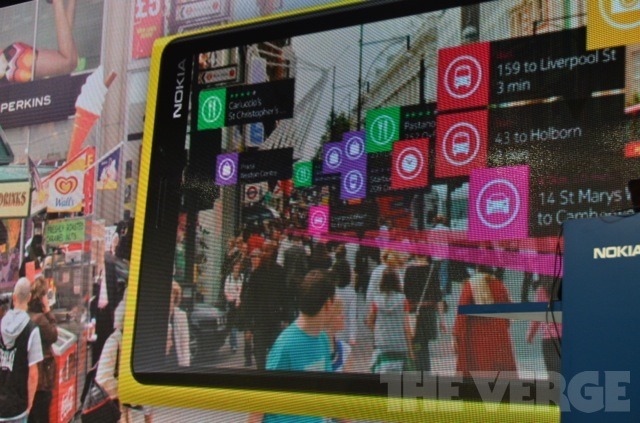 Bing Maps to be replaced with Nokia Maps. Like the existing Nokia Drive app, maps for different geographic locations can be downloaded for offline use. Full Exchange ActiveSync Device Management support. Encryption and Secure Boot for Windows Phone 8. 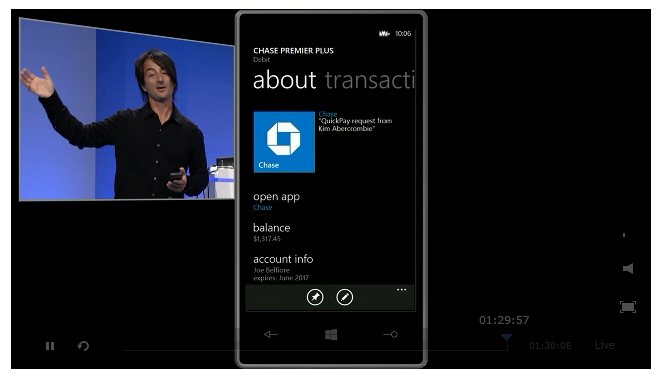 Plus, the ability to sign/deploy internal corporate apps. 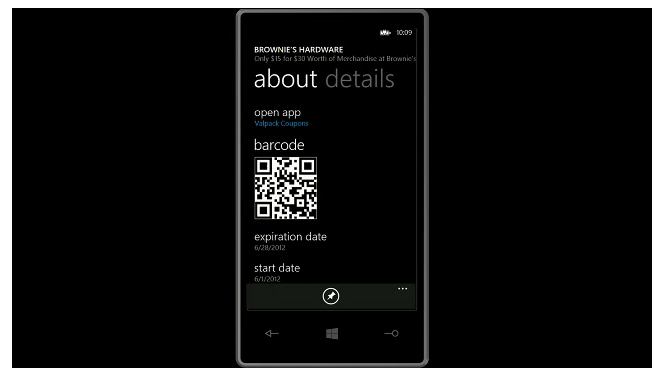 Windows Phone 8 features a new version of the Metro interface. 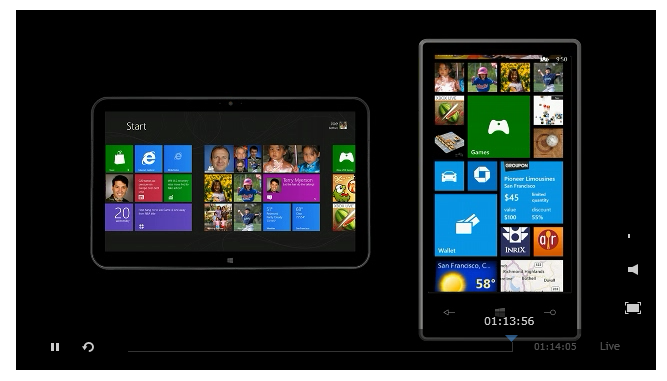 Windows Phone 7.5 and Windows 8 has two tile sizes – square and double-square. 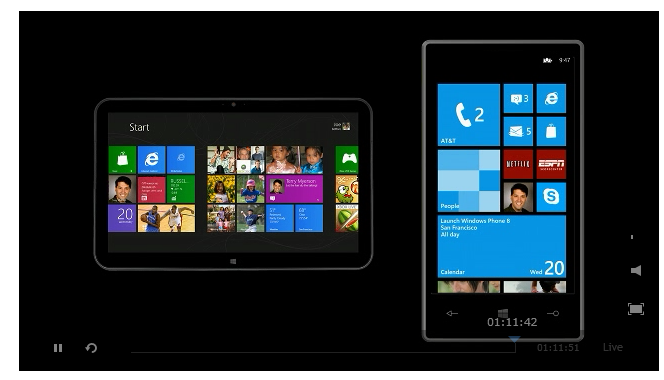 Windows Phone 8 has three tile sizes – quarter-square, square, and double-square. 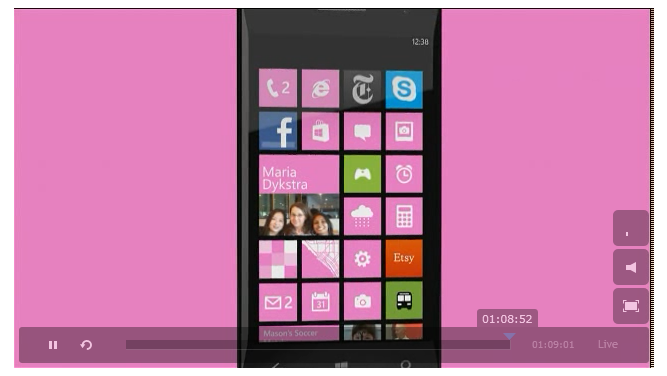 Note the Nokia Drive tile below – it can now contain live information. 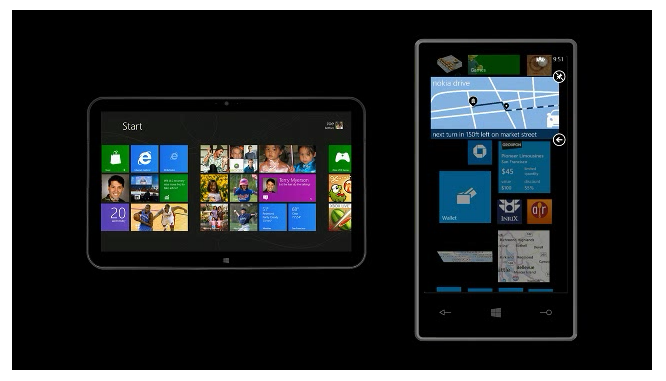 In WP8, Live Tiles become much more powerful! Windows 8 games and apps can run on Windows Phone 8 with the smallest of code-changes. 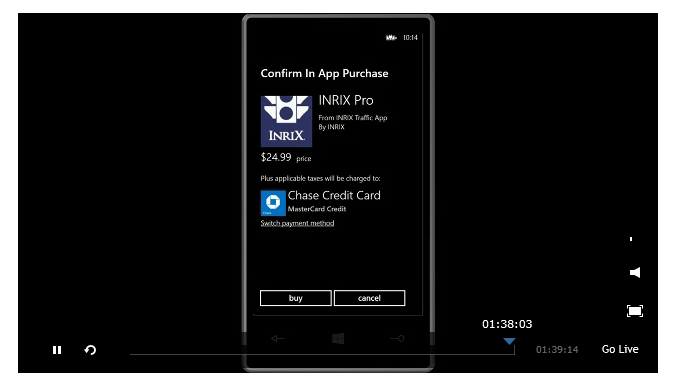 This means that the number of apps/games for WP8 will EXPLODE! After all, Windows 8 is going to have a HUGE market share just by default of being the next Windows OS. Also – it is implied that you’ll pay for a game once, and run it on either your phone, Tablet or PC. 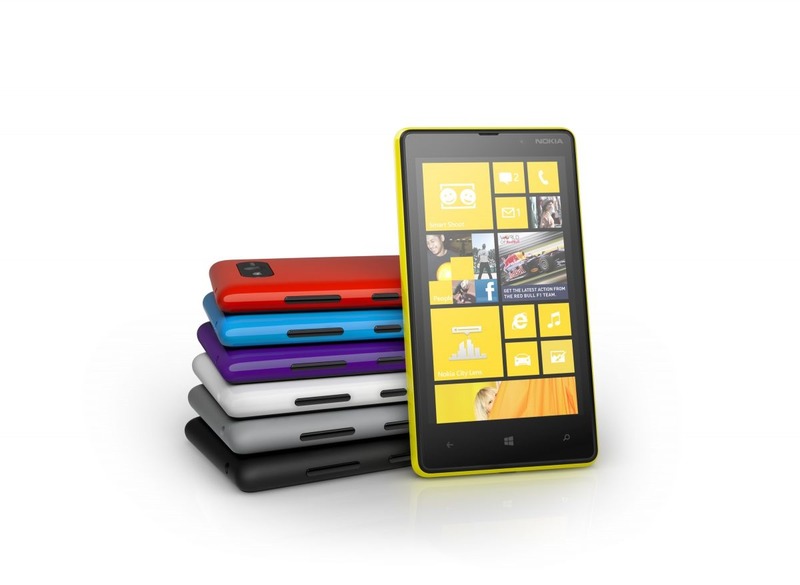 This depends on the software developer, but Windows 8 and WP8 will share a common marketplace. NFC “Tap and Send”. Simply tap your WP8 to another phone or PC to share music, photos, files, or other data. Easiest way to pair/transmit information! 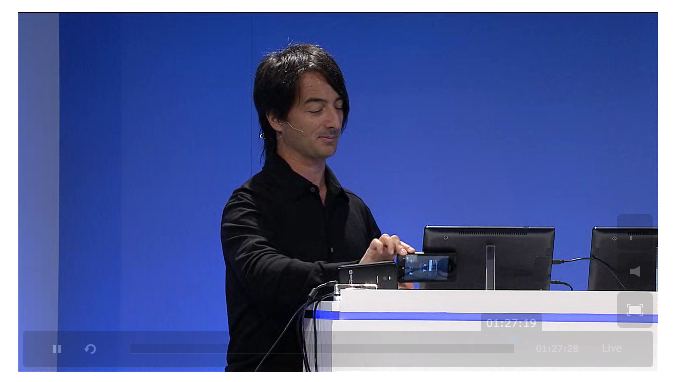 Below: Joe Belfiore demonstrating how you can tap your phone to your tablet to kick off a multi-player game! The devices create an ad-hoc peer-to-peer network connection for multi-player communications! Below: Demo of the new Wallet Hub. Below: Note the Chase bank details. If your bank allows, you’ll be able to check your balance FROM WITHIN the Wallet Hub. From there, you can click on the link to launch the actual bank app. Below: Demo of the vouchers, deals and coupon integration with the new Wallet Hub. In-app purchases are allowed. In-app and Marketplace purchases can be integrated with the Wallet Hub, allowing you to choose your method of payment (see screenshot below). 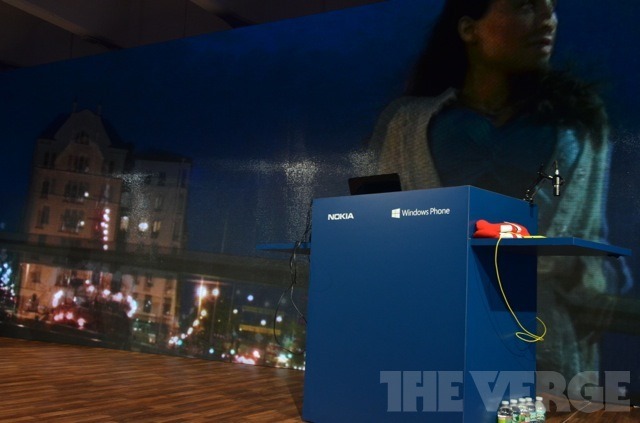 Windows Shared Core allows Direct3D on WP8 devices. Also, the networking comes from the W8 family – so expect improved Bluetooth. Not mentioned at the event, but it’s worth pointing out that, having NFC coupled with Bluetooth, will make connecting devices really easy! Voice over IP and Video Chats are now natively supported by WP8. 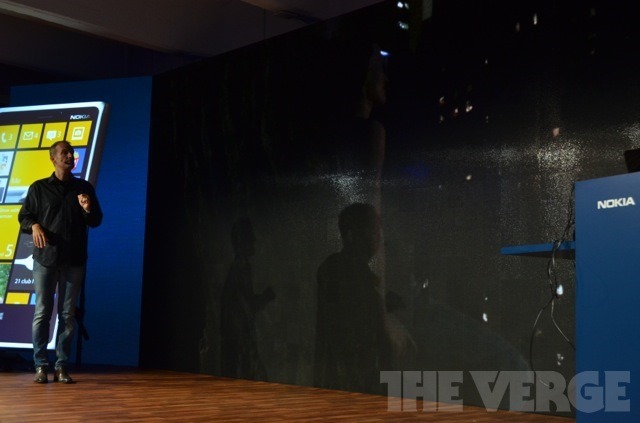 This means they can continue to function through multitasking, and also over a lock screen. 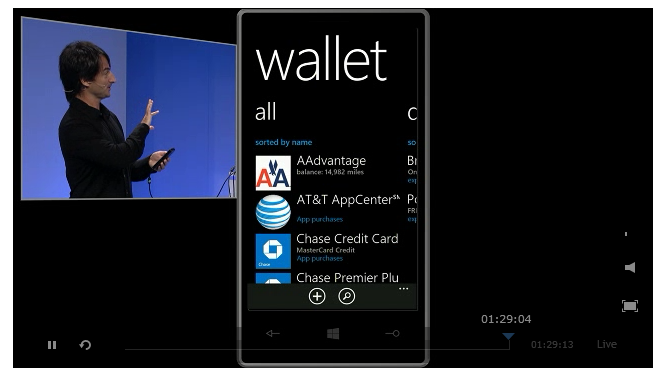 All WP7.5 apps will run on WP8. However, WP8 apps will not run on WP7.5 (not surprising, due to the switch from Windows CE to Windows Core). It’s OFFICIAL now. 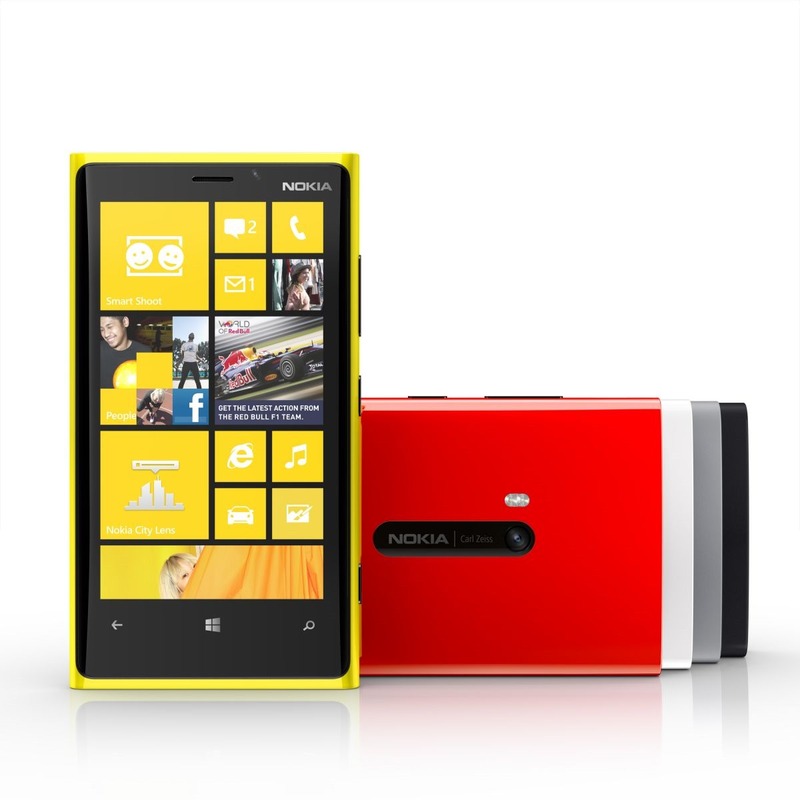 WP8 WILL NOT be available for WP7 devices. There will be at least one more release for current hardware (Windows Phone 7.8), but you WILL NEED to buy a new device for WP8. This is not as bad as it sounds, as your existing device doesn’t have WXGA, NFC, dual-core, etc. Nokia ToPlay (DLNA app), Nokia Counters (dashboard of notifications), Nokia Music 3.0 app refresh, Nokia “Camera Extras” (upgrade of core camera features) – all announced, and will be coming to existing Lumia devices. 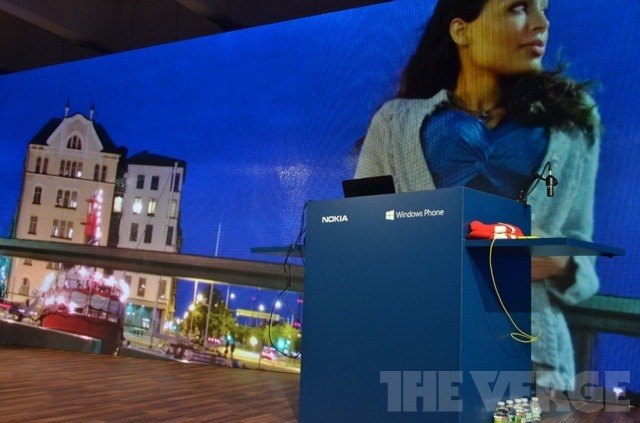 Updates to Nokia Maps, Nokia Transport and Nokia Drive also announced. …and that’s it for the moment! Keep your eyes peeled over the next two months for end-user feature announcements!